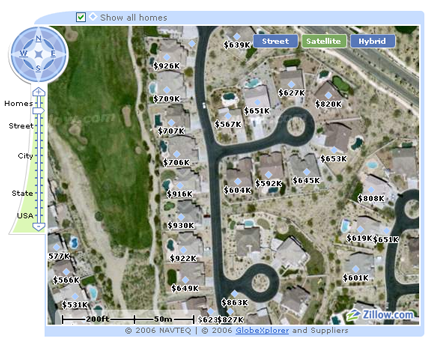 Zillow.com blows me away. It has been so hard to get home prices around the country on the internet. You usually have to enter some information and run the fear that a real estate agent might give you a call even though all you want to see is how much your house is valued. I’m not sure how accurate the values are, but looking at my neighborhood its pretty much right on. The service itself is really easy to use. The front page is almost like Google, just fill out a simple form and away you go. The map viewer is AJAX based so you barely have to wait for the housing values to come up. Update - Looks like the New York Times caught on to the story. Everyone will be using Zillow this week.